In June, The Fact Checker examined claims by President Trump and his surrogates that the special counsel team headed by former FBI director Robert S. Mueller III was tainted by the fact that several of the prosecutors were supporters of Clinton or even worked for her. We dug into the political contributions of eight team members and found that four had made political contributions and four had no record of making such contributions. 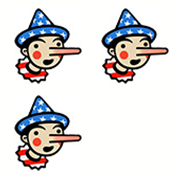 We ended up giving Trump Three Pinocchios because not all of the people hired had a record of supporting Clinton and it was false to claim that some had worked directly for Hillary Clinton. A reader asked us to provide an update, given that many more of the team members had been identified. We now have a list of 16 team members; one of the people whose background we had previously checked (FBI lawyer Lisa Page) has since left the team. So that’s an additional nine names. Let’s take a look, breaking the team up into three categories. As we have noted before, federal regulations prohibit the Justice Department from considering the political affiliation or political contributions of career appointees, including those appointed to the Special Counsel’s Office. So Mueller is legally prohibited from considering the political affiliations of the people he has hired. Deputy Attorney General Rod J. Rosenstein, who appointed Mueller, also has told Congress that it is not a disqualification for a lawyer in the Special Counsel’s Office to have made a political donation. Mueller made two donations totaling $450 to then-Massachusetts Gov. William Weld’s Senate campaign in 1996; Weld at the time was a Republican but he was the vice presidential nominee on the Libertarian Party ticket in 2016. Three members of the team came with Mueller from the law firm WilmerHale: James Quarles III, Jeannie Rhee and Aaron Zebley. Zebley, a former counterterrorism FBI agent and assistant U.S. attorney, appears to have no record of donations, but he once represented Clinton aide Justin Cooper. But Quarles and Rhee have been noteworthy political donors. Quarles, who was an assistant prosecutor on the Watergate Special Prosecution Force, donated to the last four Democratic presidential nominees: $2,700 to Hillary Clinton in 2016, $4,600 to Barack Obama in 2007 and 2008, $1,500 to John F. Kerry in 2003 and 2004 and $500 to Al Gore in 1999. He donated at least $15,000 to various other Democratic campaigns, but also gave $2,500 in 2015 to then Rep. Jason Chaffetz (R-Utah), the chairman of the House Oversight Committee, and $250 to then-Sen. George Allen (R-Va.) in 2005. Meanwhile, Rhee, who had a top post in the Justice Department’s Office of Legal Counsel under Obama, was an early donor to the Clinton and Obama campaigns and even maxxed out on her Clinton contributions. Rhee donated a total of $5,400 to Clinton’s campaign in 2015 and 2016, and a total of $4,800 to a joint Obama-Democratic National Committee fund (Obama Victory Fund) in 2008 and 2011. She also made smaller donations to various Democrats and the DNC totaling $1,750. Rhee is part of the team listed as working on the George Papadopoulos case. At WilmerHale, Rhee was a partner on the defense team representing the Clinton Foundation in a lawsuit over Clinton’s use of her private email server. Andrew Weissmann, described as Mueller’s “legal pit bull” by the New York Times, served previously with Mueller, when he was general counsel of the FBI. He has also donated to Democrats — $2,300 to the Obama Victory Fund in 2008, $2,000 to the DNC in 2006 and $2,300 to the Clinton campaign in 2007. Weissmann, who is involved in the case against former Trump campaign manager Paul Manafort, has come under sustained attacks by Republicans after an email of his to then-acting attorney general Sally Yates was discovered. “I am so proud and in awe. Thank you so much. All my deepest respects,” he wrote on Jan. 30, 2017, after she instructed the Justice Department not to defend the travel ban in the courts. Trump fired Yates, but the version she refused to defend was blocked in court. Andrew D. Goldstein was the public corruption chief in New York under U.S. Attorney Preet Bharara, who was fired by Trump. He donated $3,300 to Obama’s campaigns in 2008 and 2012. He is listed as working on the Papadopoulos case. Greg Andres, a former mob prosecutor who was a white-collar criminal defense attorney at the Davis Polk & Wardwell firm, is another veteran of the Obama Justice Department, where he headed the fraud unit from 2010 to 2012. He donated $2,700 to the campaign for Sen. Kirsten Gillibrand (D-N.Y.) in 2017 and $1,000 to the unsuccessful Senate campaign of David Hoffman (D) in 2009. He is also part of the team on the Manafort case. Other prosecutors made minor or no contributions, federal records show. Brandon Van Grack, a veteran national security prosecutor listed as involved in the guilty plea of Michael Flynn, donated $287 to Obama’s campaign in 2008. Kyle Freeny, a Justice Department trial attorney since 2007, most recently specializing in money laundering, made political contributions to Democratic presidential candidates after they clinched the nomination: $250 to both of Obama’s presidential campaigns and $250 to Clinton’s campaign in 2016. She is part of the team on the Manafort case. Lawrence “Rush” Atkinson, a trial attorney in the Justice Department’s fraud section, donated $200 to Clinton’s campaign in 2016. Zainab Ahmad, an assistant U.S. attorney in the Eastern District of New York with a stellar record in counterterrorism cases, is part of the team working on the Flynn case. Federal records show she has made no political donations. Update, Jan. 10: Ryan K. Dickey, who previously worked as an assistant U.S. attorney in the Eastern District of Virginia, joined the team in November from Justice’s computer crime and intellectual-property section. He is a specialist in computer-crime investigations. Federal records show he has made no political donations. The appellate attorneys are probably not on the front lines of prosecuting cases but provide legal advice and help evaluate whether federal laws have been broken. Only one of these lawyers have made political donations. Elizabeth Prelogar, an assistant solicitor general, donated $250 each to Clinton’s campaign and the Obama Victory Fund 2016 and 2012. Michael Dreeben, a deputy solicitor general who has argued more than 100 cases before the Supreme Court, is essentially Mueller’s legal counsel. He has made no political donations, though federal records list a man in Chicago with the same name. The Daily Caller said voter registration records indicate that 13 of the attorneys are Democrats and three have no party affiliation. It now turns out that eleven members of Mueller’s team have made political donations to Democrats, compared to five with no record of such donations. Five of the 16 known members — Rhee, Quarles, Freeny, Prelogar and Atkinson — contributed to Hillary Clinton’s 2016 campaign. So this leaves the team more unbalanced than the 4-4 split we found last June. But we are going to reaffirm the Three-Pinocchio rating. Trump asserted that the people who had been hired were “all Hillary Clinton supporters” and that obviously is not the case. Moreover, Trump said “some of them worked for Hillary Clinton.” But that is clearly wrong. Rhee, who donated the maximum amount to Clinton’s campaign, represented the Clinton Foundation in a 2015 lawsuit. Zebley, who made no political donations, represented a Clinton aide at one point. That’s not the same as working for Clinton. In any case, the DOJ is legally barred from discriminating career appointees based on political affiliation. Mueller took action against Strzok when texts expressing anti-Trump sentiments were discovered. But he can’t inquire about political leanings before hiring. in an interview on "Fox and Friends"